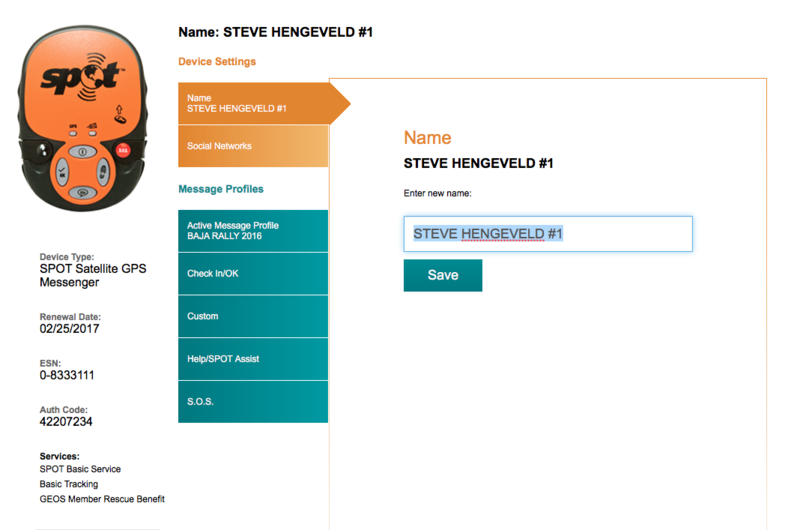 a) SPOT Tracker (or Delorme); Must be fully activated with tracking service and configured to BAJA RALLY specifications. All riders must demonstrate their SPOT is activated and functioning in order to clear technical inspection. Follow these instructions carefully. Set your "Check In/OK" message profile as described below. Using the email and phone numbers set below. 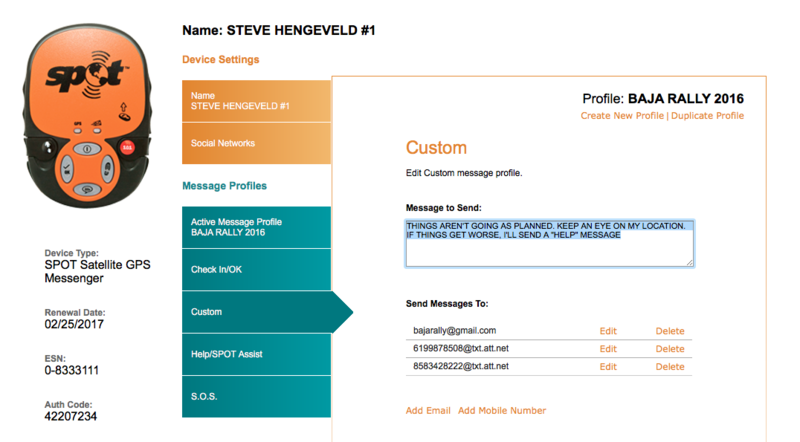 Set your "Custom message profile" with the following message and add the same email address and phone numbers from step 2 above. Your "custom message" is NOT to be used for ANY medical emergency. PARTICIPANT IN BAJA RALLY MOTORCYCLE EVENT IN REMOTE NORTHERN BAJA CA, MEXICO- OCTOBER 10-15. PLEASE CONTACT EVENT ORGANIZER TO ASSIST IN MY EMERGENCY RESCUE. 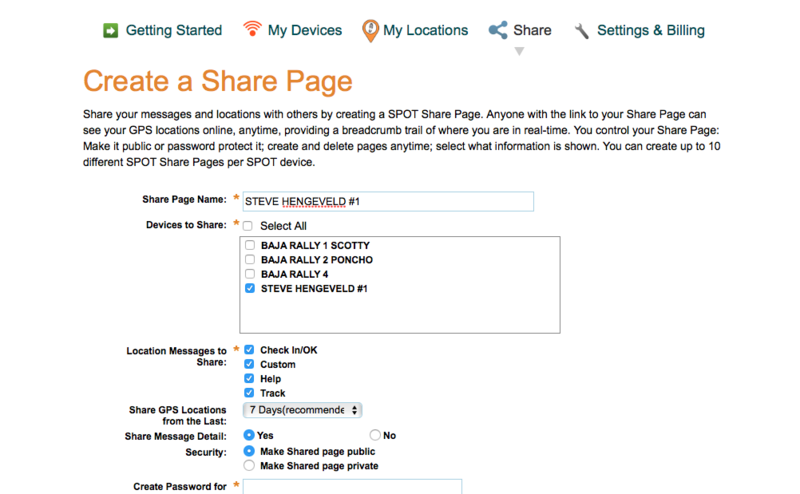 Create a Share Page and name it with your name and assigned number as below. Start by clicking the "Share" tab at the top of the page. 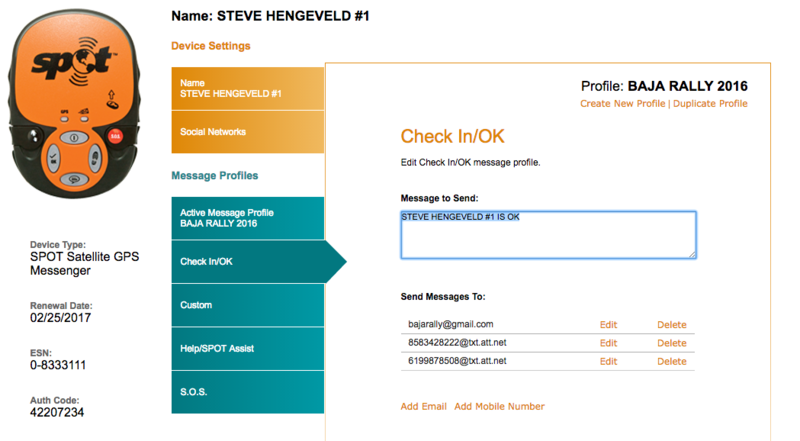 *Do NOT check the box to "Create a password for private page"
Before completing STEP 6, check the box for "Notify family and friends about this share page" and add the single email below for BAJA RALLY and add your name and assigned number in the subject box as below. Also add the same information in the "Write your email:" section as below. *If you do NOT see this screen (SPOT is debugging a technical glitch at the moment 09/13/2016), you should return back to the top of the page, click the "Share" tab and then click the orange link with your name and #. Copy the link and send to bajarally@gmail.com. 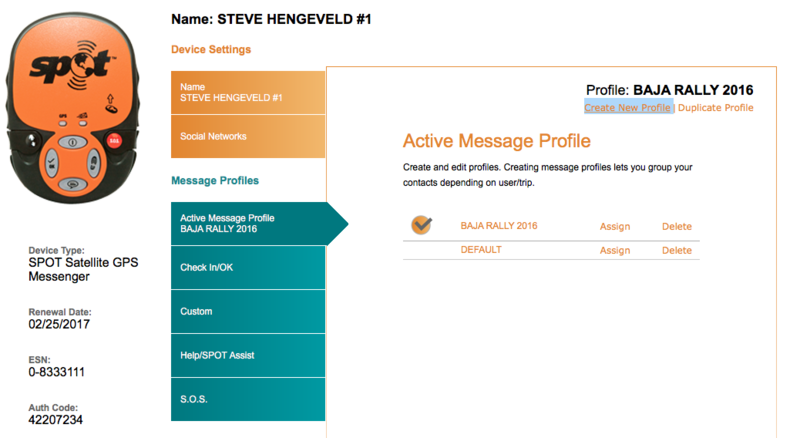 ***IMPORTANT NOTE: Do NOT use your SPOT with these configurations for any other purposes other than BAJA RALLY and IMMEDIATELY delete these setting at the end of BAJA RALLY and reconfigure your SPOT (or DeLorme) Tracker to your own settings. 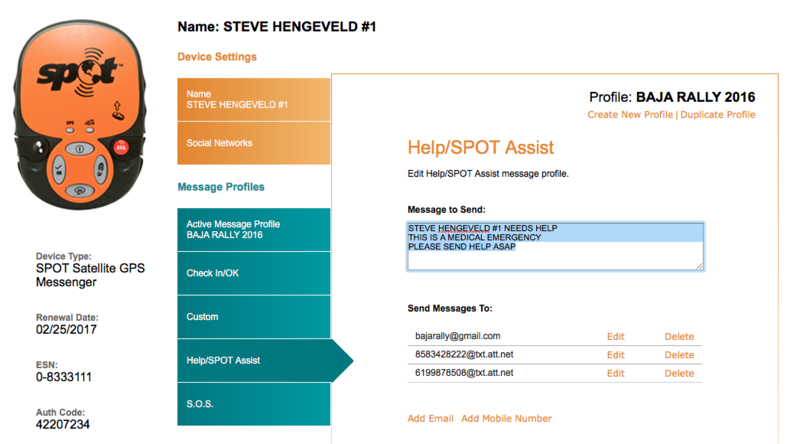 BAJA RALLY was the first competitive event of any kind to mandate the use of SPOT Tracker as a requirement for participation in May 2013. 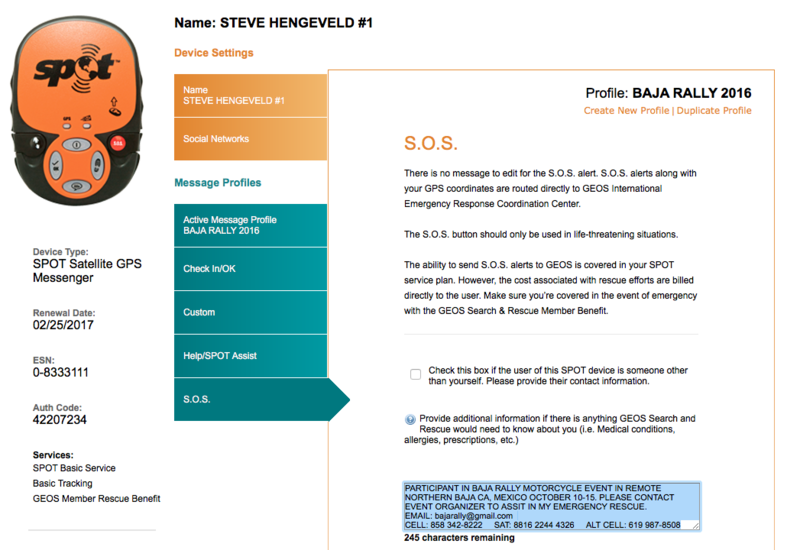 Thanks to our relationship with Globalstar and our partners at SPOT, BAJA RALLY participants, medical and support staff are eligible for a one of a kind deal on free tracking subscription. We realize not everyone already owns a SPOT Tracker and/or some participants may not have current tracking subscriptions. Therefore, we partnered with Globalstar to arrange a promo form for 1-year of free tracking with a purchase of SPOT Gen 3. Click HERE to email BAJA RALLY for the password to this one-time offer.